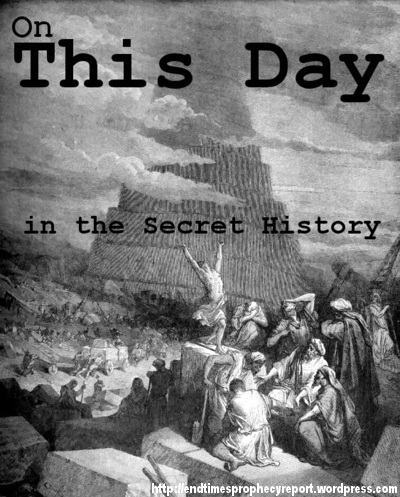 Conspiracies, murder, secret societies, torture, assassination, war: What REALLY happened on this day in history? The stories behind the grand narrative we call “history” for October 17. 539 BC – Cyrus the Great marches into the city of Babylon, releasing the Jews from almost 70 years of exile. Cyrus allows the Jews to return to Yehud Medinata and rebuild the Temple in Jerusalem. In 457, Artaxerxes I decrees that the city government of Jerusalem be re-established. Somewhere around 458 Ezra arrived in Jerusalem and 486.5 years later, Jesus was “cut off” in the middle of Daniel’s 70th week [Daniel 9:24-27]. The 70th week of Daniel was completed three and a half years after the crucifixion of Jesus Christ at the stoning of Stephen [Acts 6-7]. After that time, salvation came to the Gentiles. 1660 – Nine regicides, the men who signed the death warrant of Charles I, are hanged, drawn and quartered. The mystery of iniquity often sacrifices those who do its bidding. 1781 – American Revolutionary War: British General Lord Charles Cornwallis surrenders at the Siege of Yorktown. This effectively ends the American Revolution and gives birth to the United States of America, which some insist is the realization of Bacon’s New Atlantis. 1888 – Thomas Edison files a patent for the Optical Phonograph (the first movie). In less than 30 years, an antichrist film industry settles in Hollywood. 1973 – OPEC starts an oil embargo against a number of western countries, considered to have helped Israel in its war against Syria. 2001 – Israeli tourism minister Rehavam Ze’evi became the first Israeli minister to be assassinated in a terrorist attack.